Zoey Jones is a beautiful, rambunctious toddler who likes to wiggle around and grab at her toys. She is also a very sick little girl who has spent most of her young life at Monroe Carell Jr. Children’s Hospital at Vanderbilt University in Nashville. When I met her she had a lot of tubes and monitors connected to her tiny body. Her parents said they hate to stay in the room for long because Zoey doesn’t much like sitting still on the bed. But on the day we visited, Zoey was in for a treat. She got to dance. If you’re like me and you have young kids, you may have first discovered the band Rascal Flatts when they were featured in the kid-classic movie “Cars.” Their song, “Life is a Highway” played on an endless loop in our house as my son watched that movie over… and over… and over again. The kids at Children’s Hospital know that song, too. So when Rascal Flatts comes to visit, they sing along to the words. Zoey is too little to mouth the words, but she danced in her mom Tori’s lap. 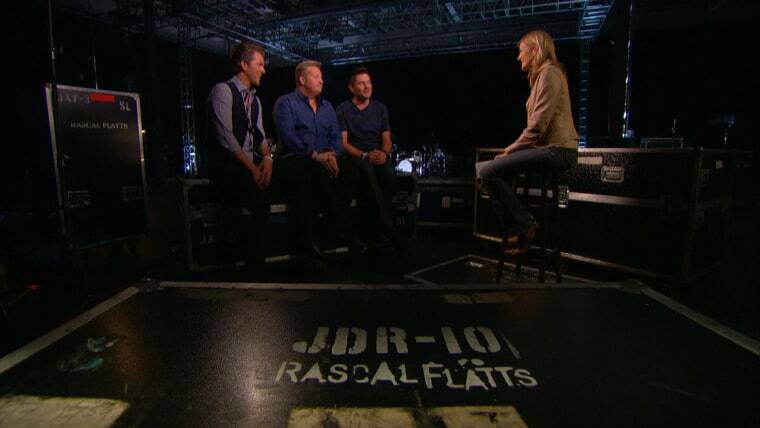 And, the thing is, Rascal Flatts comes by often. They give impromptu concerts for the children not because they have to, but because they want to. Zoey Jones has had 11 surgeries at the center. The eleventh is actually taking place today, as I write this article. She suffered a setback since we've last seen her: she's had three strokes--one of them major--that have kept her in critical condition. Her mom, Tori, told us that without the care Zoey's received at Vanderbilt, "she wouldn't be alive. There's no way. If she didn't have it, she'd be dead." Tori and her husband, Blake, had the chance to thank the band in person after their performance. "When somebody comes up and says, 'Thank you for what you do for the hospital,'" said bassist Jay DeMarcus, "it’s almost all I can do to say, 'Thank you,' because we get as much from them as we ever give to them." You can see updates on Zoey's condition on the family's Facebook page, "Zoey's Warriors." For more information on how you can help the Monroe Carell Jr. Children's Hospital at Vanderbilt, visit their website.